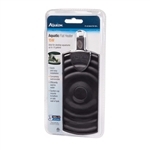 The Aqueon Flat Heater, 15 Watts, is shatterproof and fully submersible. Use the included suction cups to optimize placement within your aquarium. 4.75" x 1.75" x 9.25"
The Aqueon 100 Watt Preset Aquarium Heater requires no adjusting! The preset temperature has been calibrated to 78°, appropriate for most tropical fish. For saltwater or freshwater aquariums up to 30 gallons.